I wanna be there right now. Beautiful picture. Beautiful! I'd love to be right now. Very beautiful! The cabin looks like the design of my Dad's old cabin in the mountains...in that same area. He let the Virginia creeper take over the front porch. I sure do miss him. Sweet hugs! Ohhhhh...I'm so tired I'm going to lie down on the desk and look up...it's so beautiful, Donna. Let's all meet there in the morning for 10 am coffee! Gorgeous cabin... I'd live in that one anytime!!!!!! That just makes my heart go pitty-pat! I just want to grab a throw, a good book and a cup of good tea and nestle into a rocking chair on the porch and spend the day watching the light play on all the beautiful fall colors! That is so beautiful. I can imagine a fire, a book, cookies and milk. Gorgeous! The kind of place I dream of going to! Incredible. 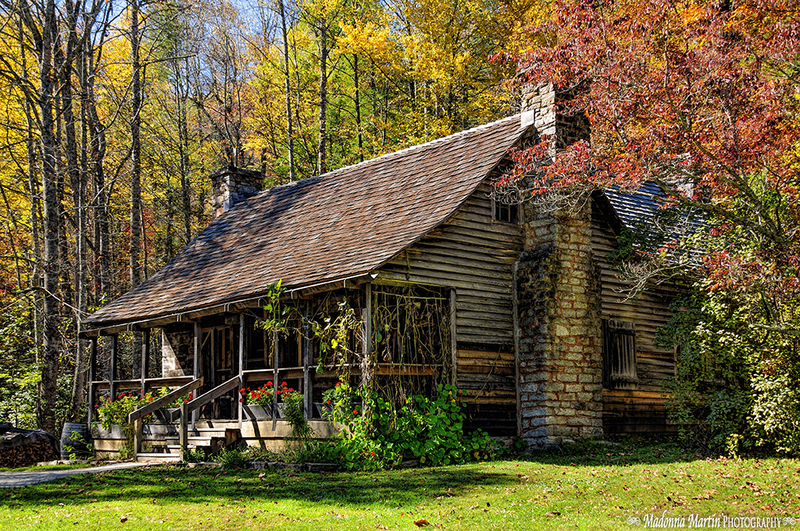 It doesn't get much better than rustic Americana. I could live there... I can sense the tranquility. I could use a little more of that. absolutely beautiful; reminds me of sitting on my porch, book in hand, something to drink and watching the sun play across the valley.